Goedendag, mijne dames en heren. Ladies and gentleman, it is a very big pleasure and honour for me to be at my first Donaldistic Seminar here at the South-Nordic Academy of Donaldism. I would like to thank the previous lecturers for some very fine and mind-stimulating papers on the big question of “Where is Duckburg”, not only concerning the situation of Duckburg City itself, but the whole geographical, socio-cultural and philosophical where-abouts of the World of the Ducks. One of my great fellow-countrymen, the Donaldistic reporter Daan Jippes, once said, when asked today’s question, Where is Duckburg, that the best place to look for Duckburg would be inside your own head. Since most of you probably best know me for my studies on Ducks on Drugs, you might expect that I will now suggest you to take an acid trip with me out of the stoned paths to the outer corners of our minds in search of Duck City, but that is not my intention. Actually, instead of dealing with the location of Duckburg, I will raise the question, “Where did the founders of Duckburg come from”? We can start by asking: Who founded Duckburg? Well, that’s easy. Every duckling in Kindergarten knows that the Burg van de Ducks was founded by Cornelius Blijsand. But then, who was he? And how did he found the city? Well, truth is, Barks tells us very little about the Father of Duckburg, apart from the interesting fact that not only did he found the city, he also created the town’s first fountain. 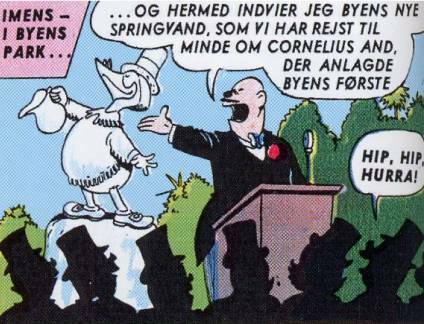 Now, according to the well-known Donaldistic reporter/scholar, Keno Don Rosa, Cornelius was just a traveling tradesman dealing in corn, who arrived on his own to a remote garrison by the coast called Fort Drakeburg in 1818, just before it was attacked by Spanish soldiers. 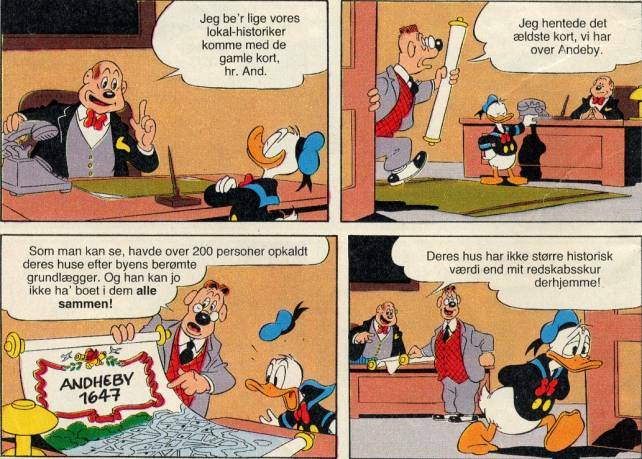 After succeeding in making the Spaniards flee, he himself owns the place and he founds a town, which becomes Duckburg - later on sold by his grandson for a mere 1,000 kroner. There is absolutely nothing in the Barksian material to support this thesis, which I personally find quite difficult to believe, especially on the question of the date. Duckburg founded as late as 1818? The clothes of Mr Blijsand certainly point back further in time. To my judgement, the jacket of Cornelius is somewhat eighteenth-centurish, while the hat may go even further back. At this point, I would like to quote the Grandmaster of Donaldism, Jon Gisle, who of course also took this important question into consideration. And I will now try to quote him in my best Norwegian, which you will hopefully bear with: »Vi har ingen sikre holdepunkter med hensyn til hvem Kornelius Kvakk var. Den herskende oppfatning er imidlertid at han var en hollender (note: En holl-and, he-he. ), noe navnet Kornelius kan tyde på. Av herr Kvakks klesdrakt slutter man at han må ha levd ca. år 1700.« And Dr Gisle continues: »I de neste par hundre år må Andeby ha vært et yndet mål for immigrerende europeiske ender. Men den nåværende befolkningssammensetning i byen viser at også andre kreaturer har slått seg ned der, og Andeby har ikke blitt noe rasistisk andesamfunn.« (Jon Gisle, “Donaldismen”, Oslo 1973, p. 71). As you all know, this last question has been intensely debated here at the Academy during the latest years, so I will not go into that. More interesting is it to note that according to Dr Gisle, the families of McDuck and Duck did not settle in Duckburg until the late nineteenth century with Scrooge as their first representative. Let us try to check out the claims of Dr Gisle. Is Duckburg indeed a Dutch burg? Well, the name Cornelius certainly has a Dutch ring to it, and his Danish family name Blijsand (som bekendt rettelig stavet Blisand, der ved nederlandsk accent imidlertid opnår fornævnte udtaleform, red. ), only supports this. His family name in American, Coot, could also very well be of Dutch origin. 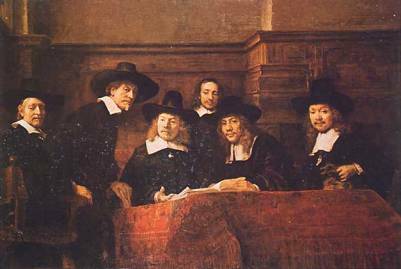 And so, I would like to show you a picture from my own family album, it is a painting by a local Dutch guy called Rembrandt, and it is showing one of my ancestors in a meeting with some other leading businessmen in Amsterdam sometime in the seventeenth century. And as you will note, both the hat and the hair have some resemblance with that of Mr Cornelius Blijsand. But the resemblance becomes much more evident, when we take a look at Mr Donald Duck in his hunting outfit, which according to himself is some old family clothes, which he keeps in the attic. Whether or not the Duck Family came with the founding father of the city, the Ducks most certainly appear to have ancestors in the Nederlands of Stella anatium. Not only Don Rosa, but also Dr Gisle may be a little too late in the dating of Duckburg’s foundation. Through two Vicarian duckuments (to Dr Gisle’s excuse published long after his grand work of 1973), we may indeed be able to narrow in considerably the year of Duckburg’s foundation. In one case, we learn that the local archive of Duckburg is in possession of an old map of the city, indeed the oldest existing of it’s kind, which is from 1647. And by this time, the city was already of some size. 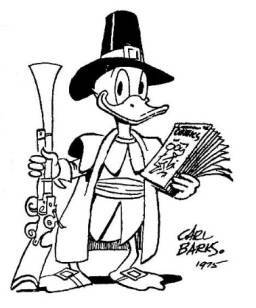 And in 1980, Vicar could report from the 350th anniversary of the Duckburg foundation, which was to be celebrated at the museum with a special exhibition on the arrival of Cornelius Blijsand and his friends through the deserts to the site of the future Duckburg. Now, 1980 minus 350 gives a potential founding year of 1630, which fits beatifully with the age of the before-mentioned map and the Dutch costumes (as I would like to - once again - draw your attention to the hats). The Dutch relation is even more supported by the fact that the anniversary exhibition also includes a painting of the historical scene made by the painter van Duck one hundred years after the famous arrival took place. 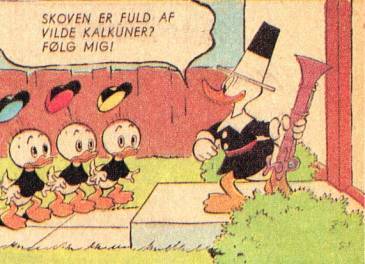 My esteemed colleagues, Dr Grobian Gans and Dr Jacobinus GrandjeAnd, have already shown how social and perhaps even religious values in Duckburg have a profound likeness to the ones developed in seventeenth- and eighteenth-century Holland and Scotland, the two European regions of most outspoken Calvinistic-Protestant observance. So I won’t go further into that, but instead continue to the last of my Donaldistic duckuments pointing to the origin of the first Duckburgians. In 1964, Carl Barks, no less, reported from a great party held in Duckburg, called the Fiest of the Dike. At this fiest, the whole town is dressed up in old Dutch costumes and they are wearing clogs, the traditional wooden shoes of the Nederlands, and they dance the clog-polka alongside the great dike of Duckburg, which protects the city from the sea. On top of the dike, they have even built a windmill in typical Dutch style, and as decoration for the fiest they use cheeses and tulips. How much more Dutch can it get? They only lack the small cookies of hashes - or maybe they even got them too? 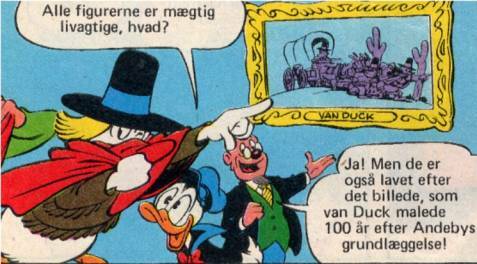 Now, to me, this whole Dike Fiest - together with the dike itself - more than anything proves that Duckburg is indeed a Dutch foundation. 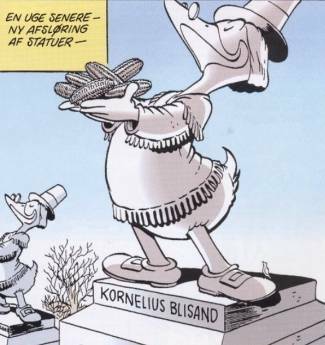 Combined with all the other presented sources, I would suggest that a group of settlers led by the holl-and Cornelius Blijsand drove through the deserts and reached the coast of the future Duckburg around 1630, and soon they were followed by several other settlers of various origin, but among them several Dutchmen (and -women, we should hope). Soon they used their knowledge of the old country on how to claim and secure the low-lying coastal areas, where the damming and the draining of fertile polder land gave the new Calvinistic and hard-working community the necessary basis to build a prosperous city, which has given us all so much pleasure later on. Now, apart from it’s evident coastal situation, all this of course say nothing about the actual location of Duckburg, only about the location from where the founders of Duckburg came. 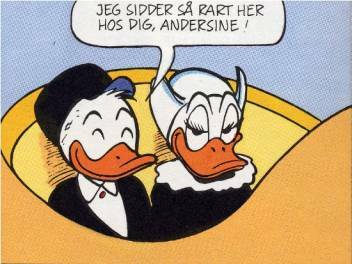 And to me, there is no doubt that also the forefathers of Donald - and perhaps too Daisy - were, indeed, among theese honorable first Duckburgians, theese Ducks in Clogs.